I am working on a new interpretation of the Louvre’s “Pastoral Concert”, one of the most famous paintings of the Venetian Renaissance. 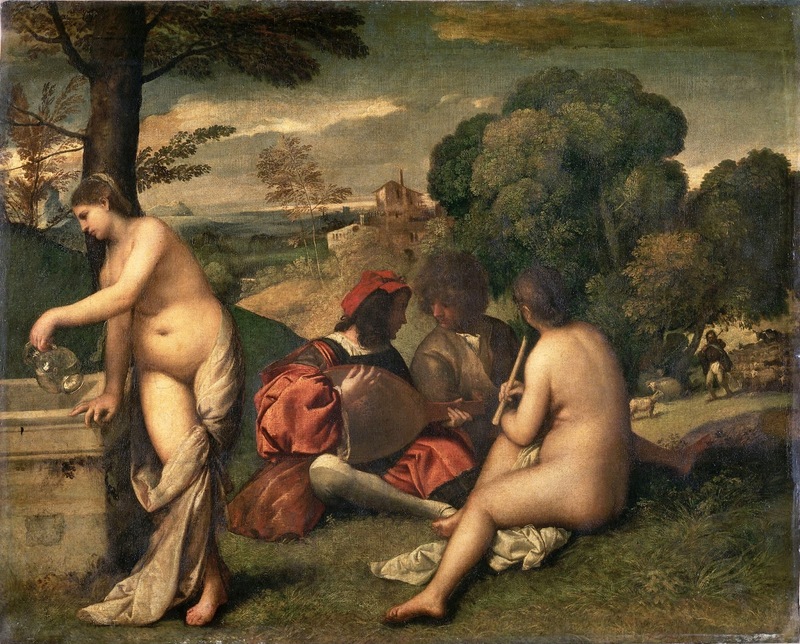 Variously attributed to Giorgione or Titian, no one has so far been able to come up with a plausible explanation of its subject. Before publishing the interpretation on my website, I would like to post some bibliographical information here. The December 1957 issue of The Journal of Aesthetics and Art Criticism featured an essay on the painting by Philipp Fehl entitled, “The Hidden Genre: a Study of the Concert Champetre in the Louvre.”[i] In his study Fehl limited himself to a discussion of the two female nudes in the painting. From this insight that was based primarily on an extensive analysis of literary sources, Fehl drew the following conclusion about the painting. He did admit that a really convincing proof would require a poem or text which, unfortunately, he had not been able to find. Wind’s comment was only in a footnote and one would suspect that he came upon Fehl’s interpretation while his own book was in process of publication. 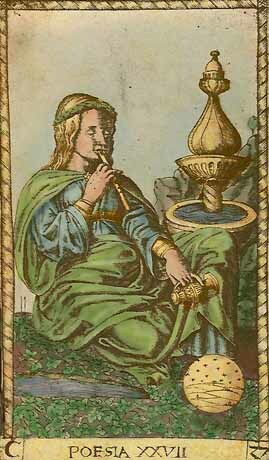 Egan found a contemporary “Tarocchi” card with an image identified as “Poesia”. Although clothed, she carried the pitcher and pipe (aulos) seen in the “Pastoral Concert”. 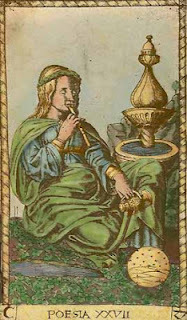 Egan admitted that the connections in the Tarocchi card have become somewhat weaker in the “Pastoral Concert.” “Poesia” has “twinned”, and each twin performs one of the actions depicted on the playing card. In 2006 Jaynie Anderson, in the catalog entry for the Bellini, Giorgione, Titian exhibition jointly sponsored by Washington’s National Gallery and Vienna’s Kunsthistorisches Museum, noted the contributions of Fehl and Egan, and claimed that their observations about the unworldly nature of the two nudes were now generally accepted by scholars. [iv] I fully agree and believe that in no way can these two females be considered as girl friends or prostitutes. However, in my interpretation of the “Pastoral Concert” I go somewhat further and attempt to better identify the muses and give a fuller account of what they are doing. Moreover, I will identify their relationship with the two men. Finally, I will identify the two men. They are the two central figures in the painting and only if they are identified, can we begin to understand the subject. [i]Philipp Fehl: “The Hidden Genre: A Study of the Concert Champetre in the Louvre,” Journal of Aesthetics and Art Criticism, XVI, 2, 1957, pp. 154-168. [ii] Edgar Wind: Pagan Mysteries of the Renaissance, New Haven, 1958. P.123, n.1. [iii] Patricia Egan: “Poesia and the Fete Champetre”, The Art Bulletin, Vol. 41 (Dec. 1959), pp. 303-313. [iv] Brown, David Alan, and Ferino-Pagden, Sylvia, Bellini, Giorgione, Titian, and the Renaissance of Venetian Painting, Washington, 2006. Catalog entry #31 by Jaynie Anderson. Entitled “Tiziano”, the Titian exhibition at Rome’s Scuderie del Quirinale is a spectacular display of a lifetime of work by the great Venetian Renaissance artist. My wife and I were able to see it last week after spending some time in London where the National Gallery has an outstanding collection of Titian and other Venetian masters. But the Scuderie show was something else. The aim of this exhibition is to authentically reconstruct his sixty year artistic journey, bringing together for the first time dozens of masterpieces, appropriately related to each phase of the artist’s life. Thus in successive passages we may grasp his careful evaluation of the tradition of Bellinian chromatic classicism and the revolution of tonalism learnt from Giorgione, right down to that dynamism of the painted surface which, together with extraordinary expressive force, opens up to the most advanced modernity. 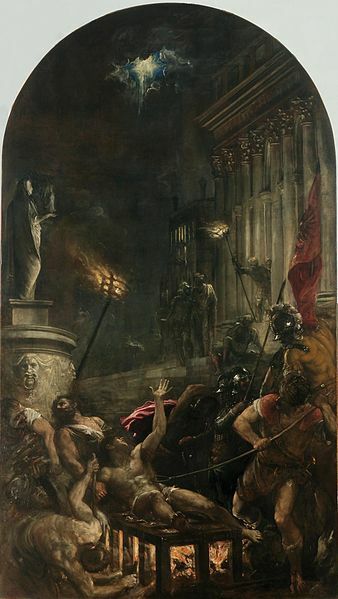 The collection Filled ten rooms on two floors of the Scuderie and the curator decided to begin with a famous Titian self-portrait from the Prado juxtaposed with a very large Martyrdom of St. Lawrence, a painting revelatory of the old man in the self-portrait. This painting set the stage for the whole exhibition in another sense. The great majority of the paintings throughout were of sacred or religious subjects. 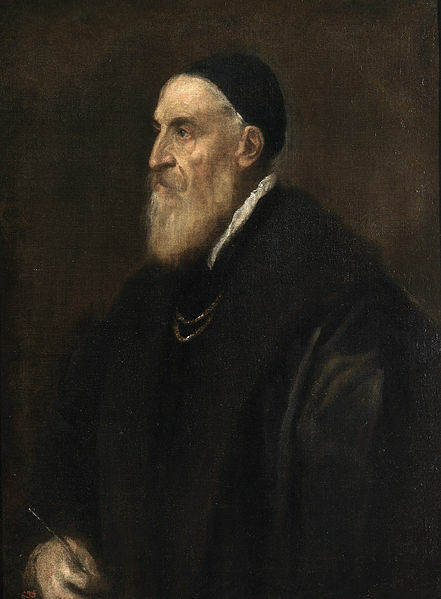 Throughout his long lifetime Titian’s patrons were devoted to these subjects and looked to Titian to bring out their full meaning. The first two rooms, for example, contained a Baptism of Christ (c. 1512); a Mystic Marriage of S. Catherine; the famous Christ being dragged by what the translator calls a “rogue”; Pope Alexander VI presenting a member of the Pesaro family to St. Peter; and three Madonnas and Child including an altarpiece from the Vatican Museum that had overwhelmed Goethe on his trip to Italy. Goethe wrote, “It shines before my eyes more than any other picture I have seen to date.” The only exception was a small so-called “Orpheus and Eurydice” that to my mind could easily be re-interpreted as a “sacred” subject. Room 3 contained more of the same including three Crucifixions. 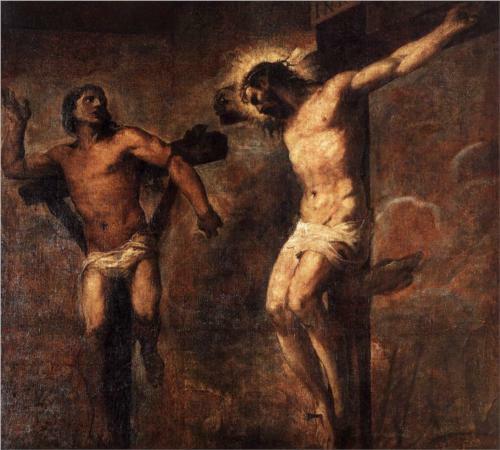 One, attributed to Titian’s workshop, was especially interesting since it depicted Christ on the Cross along with the Good Thief. Usually Christ will either be alone or pictured between the two thieves. But in this case only the two were shown side by side. 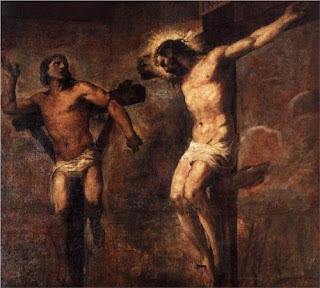 Nothing seemed to be holding the redeemed thief on his cross and he seemed to be about to fly off of it in response to the words of Christ: “this day thou shall be with me in Paradise.” A remarkable painting. Rooms 4 and 5 contained an Annunciation, the Sacrifice of Isaac, and a Deposition done for Phillip of Spain around 1559. The latter was especially interesting to me because Titian used an antique relief on a sarcophagus in a way similar to the one in the Borghese Gallery’s “Sacred and Profane Love.” The relief contained images of the sacrifice of Isaac and Cain and Abel, both symbolic of the sacrifice of Christ. 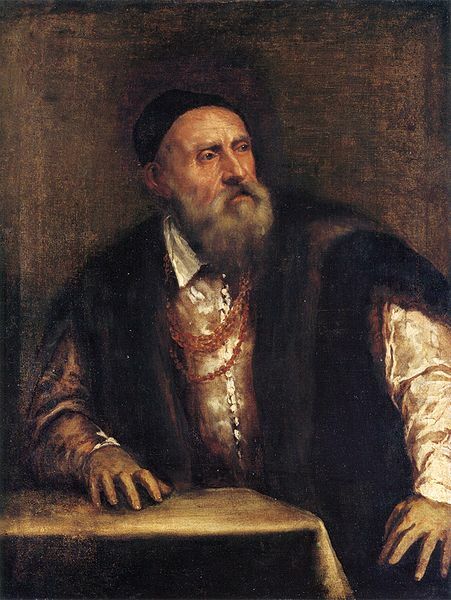 In Rooms 6 and 7 we began to experience the portraits for which Titian is so justly famous. Here we have Pope Paul III, a man with a glove, and the famous “Flora” whose image also graces the cover of the exhibition brochure as well as posters all over Rome. 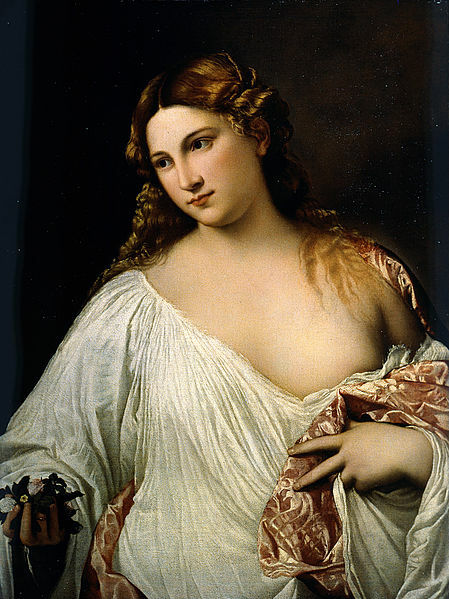 The brochure calls her a Venetian beauty but I still believe she is Mary Magdalene. She is only called Flora because of the flowers in her hand but she has no other characteristics of the nymph. Room 8 was devoted to State portraits included a couple of Doges, but in room 9 we finally got to see some of Titian’s paintings derived from ancient mythology. There was a Danae done around 1544 and now in Naples, as well as the famous painting from the Borghese Gallery of Venus blindfolding Cupid. The curator used Room 10 to bring the exhibition to an end and to recall its beginning. The “Flaying of Marsyas recalled the “Martyrdom of St. Lawrence,” but the exhibition ended with another self-portrait. This one from Berlin was done around 1562. Here is the curator’s description. In this Self-Portrait he concentrates all the warmth of the picture in the head of the old man…It is the pose of an unprecedented assertiveness where the table, pure point of light becomes an expressive instrument for highlighting the figure which is not turned towards the beholder but is gazing at a distant point with the intent look of someone deep in thought. It was a fitting end to a magnificent exhibition. Not only were the paintings of the highest order but also they were beautifully hung and lit. Wall descriptions were easy to read and informative. My wife used the audio guide and thought it was excellent. 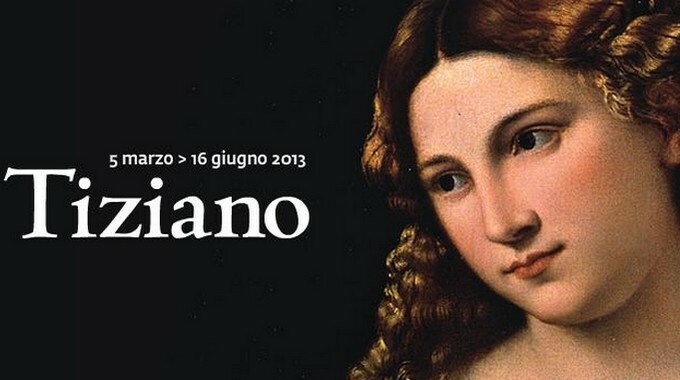 “Tiziano” must have been years in the making but it was well worth the effort.